How many jars of mustard do you have? Do you think having nine is excessive, or about the right number? A while back, the Accidental Locavore decided to clean out and inventory the refrigerator. Besides fourteen different hot sauces, there were four jars of mustard. Recently, that number jumped to nine. Why so many? For a long time I’ve had a quest to find that really strong, classic, Dijon that the French serve with almost anything, so there are always Dijon wannabes I’ve auditioned (and found wanting) in the fridge. 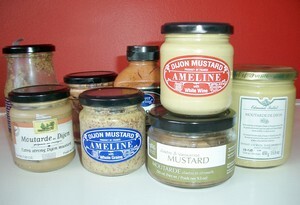 There are two artisanal jars from Ameline, a producer in Chicago who is making mustard in Dijon, France in the traditional way that I won. And our friend Zhu Zhu just brought over his favorite to go with the pate I made. Since these two jars (smooth and whole grain) from Ameline were burning a hole on the kitchen counter (moved from my desk for being too distracting), when the Locavore saw a recipe for leeks in a mustard vinaigrette, I pounced! There were beautiful leeks from the last farm box in the fridge, so I cleaned them up and braised them. 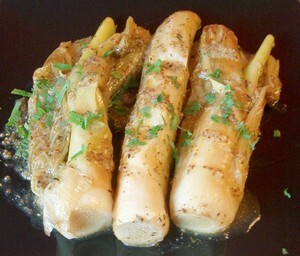 When they were done, a quick vinaigrette and voila, braised leeks. Not contented to just take a spoonful of the Ameline for the leeks, I decided to conduct an informal/impromptu mustard taste test. First the whole grain, since that is what the recipe called for. The Ameline was wonderful, full of flavor, not terribly strong, but with a good well-balanced taste. The other contender: Trader Joe’s. Well, not exactly a contender…it was really harsh and one-note. Hands-down winner: Ameline! My verdict? The Locavore thinks every refrigerator should have at least three mustards, a coarse Dijon, a quality smooth one, and an everyday one. I use the everyday one for cooking and the good Dijons for salad dressing, smearing on pâte and other things French. Zhu Zhu says he just eats it out of the jar. What about you? If you’re interested: Ameline is available at the Amish markets in NYC or e-mail info@amelinegourmet.com for stores near you. The Beaufor came from Murray’s Cheese and the Edmond Fallet from Fairway (in a cute silver bucket). 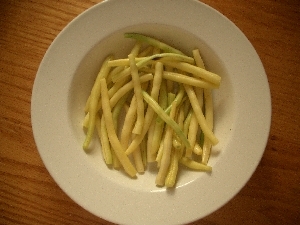 This week’s basket had some new members, wax beans (one of my husband’s favorites, who knew? ), cauliflower, broccoli, more rainbow chard, radishes, peas, mesclun. The Accidental Locavore has been on a big salad making spree, so yesterday for lunch I took some local chicken that I’d grilled and put it on top of a big salad for two. We had the mesclun, some of the snow peas, radishes, the wax beans which I steamed until just crisp-tender, and then shocked (ice and water) to stop the cooking, local bacon, herbs from the garden, a little Roquefort (definitely not local, but one of these days…and if I had some I could have used some Berkshire Blue, local and delicious) and a vinaigrette with lemon juice, mustard, balsamic vinegar, salt and pepper. Delicious and just the thing for a 90 degree Sunday. We’ve got a lot of peas, who has a great ideafor them? Bill Telepan told me to just shuck them and freeze them, so I had a big pea shucking afternoon, and am stockpiling them for the winter. This is about being incredible and fresh but hardly local. Too bad artichokes aren’t native to New York, but that doesn’t stop the Accidental Locavore from loving them! Wandering through Whole Foods is an interesting experience on any day. Last week they had magnificent giant “long stem” artichokes. I was walking around holding a pair of them, which turned out to be a good way of making new friends. One man told me he wished he lived in New York so he could have some of those artichokes. He said he eats his dipped in blue cheese dressing, which was an interesting idea. The woman in front of me in the very, very, long line, had a single artichoke, and we started talking about how we cook them. People are always surprised when they hear that I steam them in the microwave. 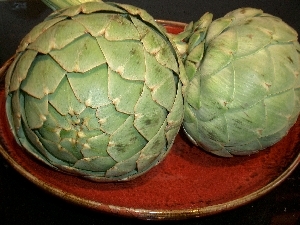 To do that, cut off the stem at the base of the artichoke. If, like these, there is a long stem, you can peel it and steam it too, just be careful to peel it down to the core, or it will be bitter. Rinse them. Now here’s the not very green part…I wrap them in Saran Wrap, but you can wrap them in parchment paper if cooking in plastic makes you squeamish. Depending on the size of the artichokes, and the strength of your microwave, cook them for 5-10 minutes. 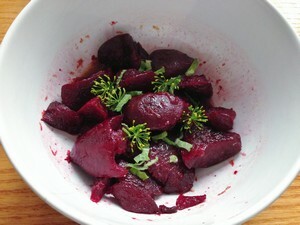 You can check to see if they’re cooked, by pressing on the base of the stem, it should give when they are fully cooked. 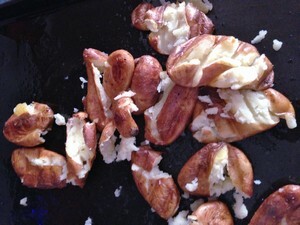 If I’m eating them hot, I’ll just melt some butter, and add a squirt of lemon juice. Sometimes I let them cool down, and make a vinaigrette with balsamic vinegar, a little lemon juice, olive oil, salt &amp; pepper. 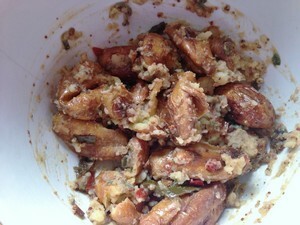 You can add some Dijon mustard, a minced shallot, or some crushed or finely minced garlic too. What are some of your favorite things to dip artichokes in?